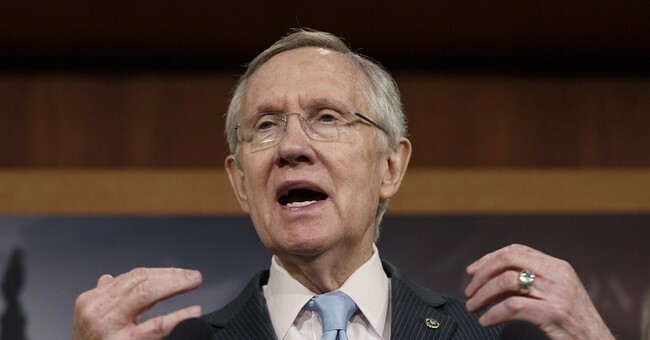 Harry Reid on Obamacare Horror Stories: "All of Them Are Untrue"
If Paul Krugman read the paper he writes for, he would have heard about Mike Horrigan, a lifelong Democrat and a former Obamacare supporter. As the Times wrote in December, Horrigan’s “coverage by a state high-risk insurance program was eliminated, then replaced by a more expensive plan. His wife’s individual plan was canceled for being substandard, then suddenly renewed — also at a higher price.” The Times also brought out the story of Barbara Meinwald, whose temporary plan with fewer doctors would cost her $5,000 more a year. “Meinwald also looked on the state’s health insurance exchange,” Anemonia Hartocollis writes, “but she said she found that those plans did not have a good choice of doctors, and that it was hard to even find out who the doctors were, and which hospitals were covered.” Camille Sweeney, written about in the same article, was “dismayed” that neither her pediatrician nor general practitioner was on the plans offered on her state’s exchange. Literally tens of millions of Americans have been impacted by Obamacare's false promises. From the truly horrific stories, to the millions whose coverage was canceled (or whose plans' networks have been pared down), to the tens of millions on the individual and small group markets whose costs are increasing, vast swaths of the population have been harmed by this law -- with more pain on the horizon. If you choose to deny or ignore this empirical reality, you might just be the sort of cartoonish hack that you smugly believe only exists on "the other side." And to Krugman et al, this is what non-hackery looks like.